A Conveyancer as a career is a rewarding job. The Conveyancing world is always changing. In my opinion that is what keeps it interesting and that is what I love about my chosen career. It is fast paced and there is always a deadline. A Conveyancer is responsible for the transfer of legal title of land from one person or entity to another. No file is ever the same and it is our job to provide the same stress-free service to all our clients. We will always act with integrity and honesty to ensure our clients understand their rights when entering into a contract. It is recommended that a buyer and a seller are aware of their rights when entering into a contract to purchase or sell land. That is where we come in. It is rewarding to know that we are able to allow a buyer or seller the opportunity to complete their property transfer with knowledge, ease and a stress free experience. I was introduced to conveyancing in 2015 and started as an assistant before completing my Advanced Diploma in Conveyancing. I found that the conveyancing world challenging but rewarding. This is not only because we are able to assist our clients in what is most likely to be a confusing process but because we are always learning and always striving to improve our service. We meet many new faces including new clients, other Conveyancers and other like-minded property experts in the industry. Conveyancing takes a lot of attention to detail, a lot of triple checking and patience. We must keep up to date with the constant changes to legislation and the introduction of electronic conveyancing. We have to be good communicators, be willing to adapt to change and priorities well. It is important to keep our clients updated on the progress of their transaction and ensure they understand the process. 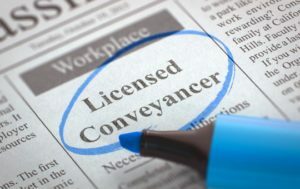 We are always working with other Conveyancers in the industry. We liaise with other parties on a day-to-day basis whether that is face to face, at settlements, by phone or electronically. It is a great industry knowing that Conveyancers from different workplaces are able to work together to achieve the same goal which is to provide quality service for our clients and a smooth settlement. I would recommend conveyancing as a career if you are interested in the property industry, enjoy learning about property law and have a passion for good quality service to clients.